After purchasing a license for this course, you can access the course at My Account. 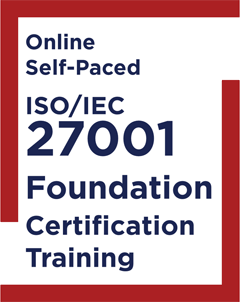 The self-paced online ISO/IEC 27001 Foundation course is designed to provide knowledge of what an information security management system is and the minimum requirements that organizations should aspire to, within the context of ISO/IEC 27001, the international information security management standard. The course prepares you for the formal certification exam of APMG, which will test you on your capability to “recognize” and “understand” the ISO/IEC 27001 concepts that are explained during the course. The course consists of ten lessons. Each lesson is concluded with a quiz to test your exam preparedness. On average, it takes 16 hours to complete the lessons and the quizzes. Your course license is valid for 4 months. APMG's ISO/IEC 27001 Foundation certification exam and exam fees are not included in this course and the course fees. Upon completion of the course you can contact us to purchase and schedule the APMG certification exam through us. The APMG exam fees are USD $200. The certification exam consists of 50 multiple choice questions. It is a closed book exam that lasts 40 minutes. You need to answer 25 questions or more correctly in order to pass.